Have you decided to do something good for your body and improve your fitness? Great! Are you frustrated that a week of training hasn’t done much? That can happen. You shouldn’t give up on a toned body so quickly. It takes hard work, motivation and time. Learn more below about how you can reach your personal goal step by step. Having variety in your training is important to stay on the ball. 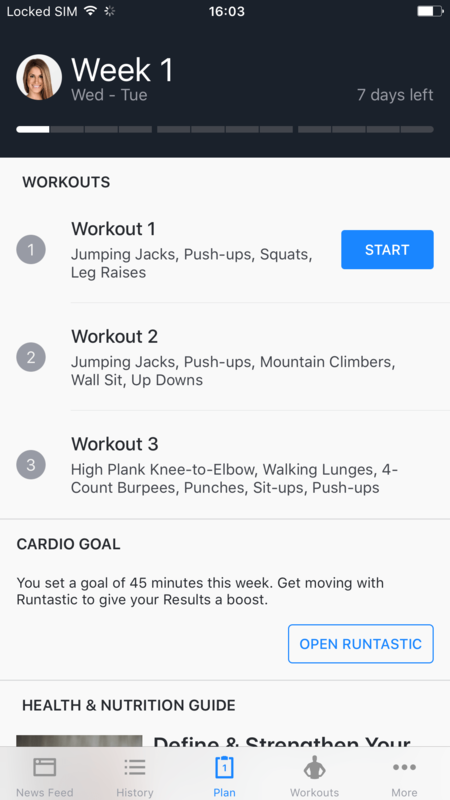 That is precisely what the new feature in the Results app offers you: the option to mix it up and set an additional Cardio Goal. 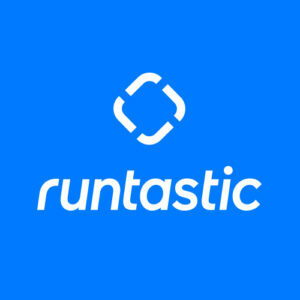 All the activities you track with your Runtastic app will be synced automatically. For the right mix of bodyweight and cardio training. Why is it important to have specific goals? They motivate you and take you further! Your motivation and personal satisfaction grow with every goal you achieve. Let’s assume that you want to run 780 km in a year. And now imagine how happy you will feel when you reach your yearly running goal in December. It feels awesome, right? 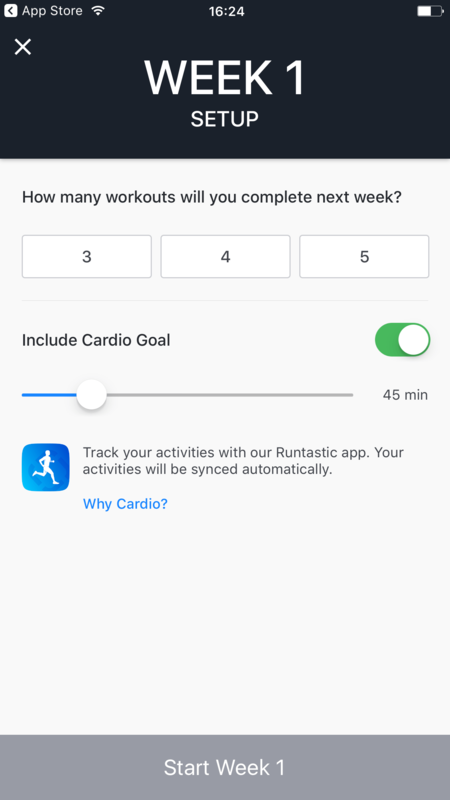 That’s exactly what the new feature in your Runtastic app is all about: From now on, you can set a Yearly Running Goal. 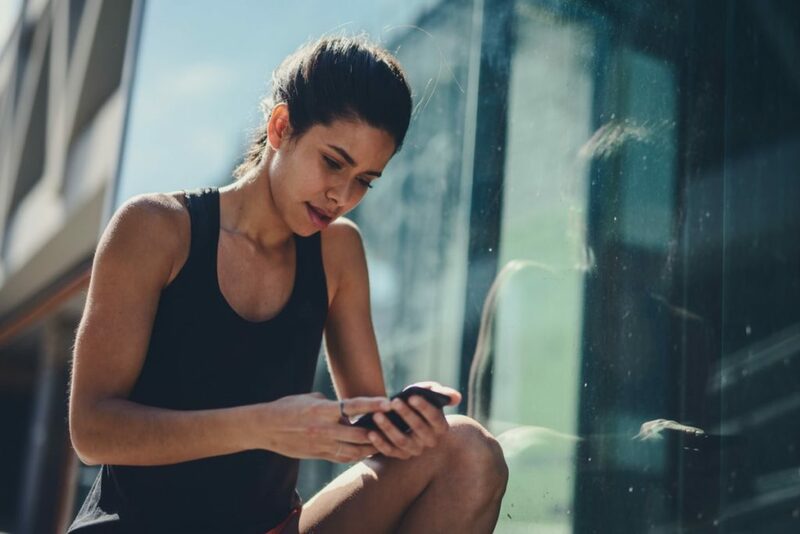 The app shows you how many kilometers you need to run per week to reach your total number of kilometers for the year. The Yearly Running Goal is easy to set and can be found in your personal user profile. One thing is for sure: Change doesn’t happen overnight. If you expect too much in a short amount of time, your motivation will decrease and your frustration will increase. Many magazines advertise miracle diets that help you lose 12 kilos (26.5 pounds) in 12 days. But let’s be honest, that’s unrealistic. Losing 12 kilos in 12 weeks, on the other hand, is entirely doable. It takes time to shed weight and build muscle. One way to avoid losing your motivation is to set small intermediate goals. This helps you stay interested in exercising and gives you the feeling of success more frequently. Always try to focus on the benefits of hard training and a long-term healthy diet. Whether you are into endurance sports, strength training, yoga or soccer – the main thing is that fitness should be fun and never boring. When you enjoy the workout, you stick with it. Therefore, it pays off to try out new things from time to time to keep pushing your body and mind. A perfect way to combine endurance and strength training is with bodyweight training. It requires no equipment, takes little time and is highly effective. Don’t think your body has changed after three weeks of regular training and a balanced diet? Measure your waist, hips, thighs or biceps with a measuring tape and document your fitness journey by taking photos. When the scale doesn’t show the desired result, (i.e. fewer kilos or pounds) it doesn’t necessarily mean you’re doing something wrong. It can be the case that you lost fat, but put on muscle mass. When you begin to do bodyweight training or start running, you are pretty much guaranteed to get sore muscles. You may be tempted to give up, but stick with it! At the beginning, your body is not prepared for the new demands placed upon it. Give yourself a short break and don’t expect too much. The good news is that things will get easier with each workout and your muscles will ache less. After working out, take a hot bath or a contrast shower. Apply lotions and creams to promote circulation. Engage in moderate exercise or give your body a break. A visit to the sauna can also relax your muscles. Cherries, beetroot or coffee beans contain antioxidants. They thus act as anti-inflammatories, easing aching muscles or even preventing muscle tension. Finally, we would like to stress once again that there is no magic pill to help you achieve your ideal body. Transforming your body requires willpower and patience. In the end you will have visible proof of your transformation and can be proud of yourself. Don’t forget: The journey is the reward. Are you still working towards your ideal body or have you already reached your goal? Share your experiences with us – we’d love to hear about them!